The Abbot of Malmesbury and Bishop of Sherborne, Aldhelm wrote 'About Virginity' ('De Virginitate') in two versions. He wrote the first about 705 in prose for Abbess Hildelith and the nuns of Barking. A few years later he produced a poetic version of the work. This manuscript presents the prose version and a copy of one of his letters. 'About Virginity' concerns purity as a Christian virtue. Aldhelm uses allegory to portray his subject, using elaborate images of the early Christian male and female virgin martyrs as warriors and athletes triumphing over evil. Aldhelm's style in Latin matches his elaborate images, full of obscure figures of speech and difficult grammar. Despite its difficulty, 'About Virginity' was copied in this manuscript at Winchester two centuries after he died. 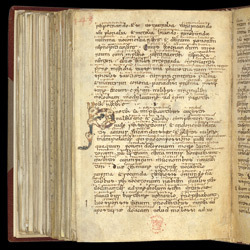 King Alfred the Great admired his writings, and it is possible that his admiration brought about this copy, following his program to revive learning. The larger writing on this page is of the early 10th century. The smaller writing between the lines are glosses or words written to aid the reader's understanding, mostly done in the late 10th century in Latin and Old English. The intensive glosses are an indication of how difficult Aldhelm's Latin prose is to read. During the 10th century many earlier manuscripts were glossed in this way because the church was trying to raise standards of learning. Book 50 begins on this page, its first letter writhing with biting animal heads. The fantastic beasts drawn to suggest three-dimensionality and the soft, warm colours are typical of early 10th-century decorative styles.